Official ticket sales for all bullrings in Madrid. Fast and secure online ordering. Immediate information of all the Bullfighting Festivals. A virtual store with the most powerful technology and design of the sector. Easy navigation, transactions with high security and confidentiality of data. Bullfight tickets to Madrid, all bullfights organized in the Bullring of Madrid Poster Official 2019. Festival of Madrid San Isidro 2019. The San Isidro bullfighting is the most internationally prestigious fair. 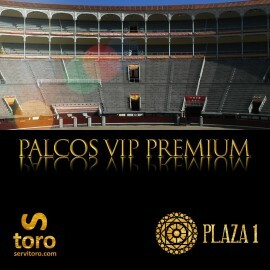 In May is celebrated in numerous Las Ventas bullfighting and livestock figures which pass the first level. San Isidro Festivities: May 14th to June 16th. Bullring of Ajalvir, Madrid. Bullfighting show in January 25th, 26th and 27th. San Blas festivities in Ajalvir 2019. Two bullfighting shows. Ajalvir is to 29,7 km from Madrid (30 minutes' drive from Madrid). How to get here | Driving Direction. San Blas Fair: January 25th, 26th, 27th. Request information and advance tickets booking for all bullfighting events in Ajalvir: You may book in advance and be the first to purchase tickets to any event at the Ajalvir Bullring Servitoro delivery service offers the User the opportunity to acquire the tickets in a safe and easy manner from his/her home address, avoiding long queues before ticket offices. Servitoro offers to non-residents the opportunity to deliver the tickets to hotels, hostels and similar during their stay in Spain and coinciding with the bullfight event (2-4 days before the show). Servitoro, Official Box office of bullfighting tickets sales at Ajalvir, Madrid bullring. Bullfight tickets to Alcalá de Henares, all bullfights organized in the Bullring of Alcalá de Henares Poster Official 2019. Fast and secure online ordering. Immediate information of all the Bullfighting Festivals. A virtual store with the most powerful technology and design of the sector. Easy navigation, transactions with high security and confidentiality of data. All the information about bullfighting, bullfighters and bullring of Alcalá de Henares. Alcalá de Henares is located 35 kilometres from Madrid Center. How to get to Alcalá de Henares. Request information and advance tickets booking for all bullfighting events: You may book in advance and be the first to purchase tickets to any event at the Colmenar Viejo bullring. Servitoro delivery service offers the User the opportunity to acquire the tickets in a safe and easy manner from his/her home address, avoiding long queues before ticket offices. Complete the request information about Colmenar Viejo. Once we have the tickets on sale, we send you a booking confirmation e-mail for make your definitive order. Servitoro offers to non-residents the opportunity to deliver the tickets to hotels, hostels and similar during their stay in Spain and coinciding with the bullfight event (2-4 days before the show). Servitoro, Official Box office of bullfighting tickets sales at Alcalá de Henares, Madrid bullring. Tickets bulls for all organized bullfights in the Bullring of Boadilla del Monte, Madrid. Bullfighting Festival Virgen del Rosario of Boadilla del Monte in March 2019. All the information about bullfighting, bullfighters and bullring of Boadilla del Monte. Boadilla del Monte is located 27 kilometres from Madrid Center. How to get to Boadilla del Monte. Bullfighting festival of Virgen del Rosario Festival: date to be confirmed. Request information and advance tickets booking for all bullfighting events: You may book in advance and be the first to purchase tickets to any event at the Boadilla del Monte bullring. Servitoro delivery service offers the User the opportunity to acquire the tickets in a safe and easy manner from his/her home address, avoiding long queues before ticket offices. Complete the request information about Boadilla del Monte. Once we have the tickets on sale, we send you a booking confirmation e-mail for make your definitive order. Servitoro offers to non-residents the opportunity to deliver the tickets to hotels, hostels and similar during their stay in Spain and coinciding with the bullfight event (2-4 days before the show). Servitoro, Official Box office of bullfighting tickets sales at Boadilla del Monte, Madrid bullring. Bullring of Colmenar de Oreja. Festivities in honor to Stmo. Cristo del humilladero 2019. Two bullfighting shows. Fast and secure online ordering. Immediate information of all the Bullfighting Festivals. A virtual store with the most powerful technology and design of the sector. Easy navigation, transactions with high security and confidentiality of data. Colmenar Viejo is located 59 kilometres from Madrid Center. How to get to Colmenar de Oreja. Festivities in honor to Stmo. Cristo del humilladero: date to be confirmed. Request information and advance tickets booking for all bullfighting event : You may book in advance and be the first to purchase tickets to any event at the colmenar de Oreja bullring. Servitoro delivery service offers the User the opportunity to acquire the tickets in a safe and easy manner from his/her home address, avoiding long queues before ticket offices. Servitoro offers to non-residents the opportunity to deliver the tickets to hotels, hostels and similar during their stay in Spain and coinciding with the bullfight event (2-4 days before the show). Servitoro, Official Box office of bullfighting tickets sales at Colmenar de Oreja (Madrid) bullring. Bullfight tickets to Colmenar Viejo, all bullfights organized in the Bullring of Colmenar Viejo. Festival Taurino en honor a la Virgen de los Remedios 2019. Fast and secure online ordering. Immediate information of all the Bullfighting Festivals. A virtual store with the most powerful technology and design of the sector. Easy navigation, transactions with high security and confidentiality of data.Colmenar Viejo is located 37 kilometres from Madrid Center. How to get to Colmenar Viejo. * Free Children up to 9 years of age accompanied by an adult occupying the location NOT SOLD. Virgen de los Remedios festivities: date to be confirmed. Servitoro, Official Box office of bullfighting tickets sales at Colmenar Viejo (Madrid) bullring. Bullfight tickets to Galapagar, all bullfights organized in the Bullring of Galapagar. Bullfighting Festivals 2019. Fast and secure online ordering. Immediate information of all the Bullfighting Festivals. A virtual store with the most powerful technology and design of the sector. Easy navigation, transactions with high security and confidentiality of data. Galapagar is to 36 km from Madrid (40 minutes' drive from Madrid). How to get here | Driving Direction. Bullfighting Festivals: Still needs to be confirmed. Servitoro, Official Box office of bullfighting tickets sales at Galapagar, Madrid bullring. Tickets bulls for all organized bullfights in the Bullring of Getafe, Madrid. Virgen de los Ángeles Festival of Getafe in May 2019. All the information about bullfighting, bullfighters and bullring of Getafe. Getafe is located 15 kilometres from Madrid Center. How to get to Getafe. June. Virgen de los Ángeles Festival. 1 or 2 Bullfight spectacles: date to be confirmed. Request information and advance tickets booking for all bullfighting events: You may book in advance and be the first to purchase tickets to any event at the Getafe Bullring. Servitoro delivery service offers the User the opportunity to acquire the tickets in a safe and easy manner from his/her home address, avoiding long queues before ticket offices. Complete the request information about Getafe. Once we have the tickets On sale, we send you a booking confirmation e-mail for make your definitive order. Servitoro offers to non-residents the opportunity to deliver the tickets to hotels, hostels and similar during their stay in Spain and coinciding with the bullfight event (2-4 days before the show). Servitoro, Official Box office of bullfighting tickets sales at Getafe, Madrid bullring. Bullfight tickets to Leganes, all bullfights organized in the Bullring of Leganes Poster Official 2019. Fair of Leganés 2019. Fast and secure online ordering. Immediate information of all the Bullfighting Festivals. A virtual store with the most powerful technology and design of the sector. Easy navigation, transactions with high security and confidentiality of data. Leganés is to 19,5 km from Madrid (30 minutes' drive from Madrid). How to get here | Driving Direction. Request information and advance tickets booking for all bullfighting event : You may book in advance and be the first to purchase tickets to any event at the Bullring. Servitoro delivery service offers the User the opportunity to acquire the tickets in a safe and easy manner from his/her home address, avoiding long queues before ticket offices. Complete the request information about Leganés. Servitoro offers to non-residents the opportunity to deliver the tickets to hotels, hostels and similar during their stay in Spain and coinciding with the bullfight event (2-4 days before the show). Servitoro, Official Box office of bullfighting tickets sales at Leganés, Madrid bullring. Bulls Tickets to Las Matas for all organized bullfights in the Bullring of Las Matas, Madrid. Festival of Las Matas May 2019. Las Matas is to 26,3 km from Madrid (30 minutes' drive from Madrid). How to get here | Driving Direction. May. Bullfighting festival (still needs to be confirmed). Request information and advance tickets booking for all bullfighting events: You may book in advance and be the first to purchase tickets to any event at the Las Matas Bullring. Servitoro delivery service offers the User the opportunity to acquire the tickets in a safe and easy manner from his/her home address, avoiding long queues before ticket offices. Complete the request information about Las Matas. Once we have the tickets On sale, we send you a booking confirmation e-mail for make your definitive order. Servitoro offers to non-residents the opportunity to deliver the tickets to hotels, hostels and similar during their stay in Spain and coinciding with the bullfight event (2-4 days before the show). Servitoro, Official Box office of bullfighting tickets sales at Las Matas, Madrid bullring. Bullfight tickets to Las Rozas, all bullfights organized in the Bullring of Las Rozas. Feria Taurina San MIguel 2019. Fast and secure online ordering. Immediate information of all the Bullfighting Festivals. A virtual store with the most powerful technology and design of the sector. Easy navigation, transactions with high security and confidentiality of data. Las Rozas is to 18,6 km from Madrid (26 minutes' drive from Madrid). How to get here | Driving Direction. Fair San Miguel: date to be confirmed. Servitoro, Official Box office of bullfighting tickets sales at Las Rozas, Madrid bullring. Tickets bulls for all organized bullfights in the Bullring of Majadahonda. Bullfights are held throughout September. Santísimo Cristo De Los Remedios Festivities. All the information about bullfighting, bullfighters and bullring of Majadahonda. Santísimo Cristo De Los Remedios: date to be confirmed. Request information and advance tickets booking for all bullfighting events in Majadahonda: You may book in advance and be the first to purchase tickets to any event at the Majadahonda bullring. Servitoro delivery service offers the User the opportunity to acquire the tickets in a safe and easy manner from his/her home address, avoiding long queues before ticket offices. Complete the request information about Majadahonda. Once we have the tickets on sale, we send you a booking confirmation e-mail for make your definitive order. Servitoro offers to non-residents the opportunity to deliver the tickets to hotels, hostels and similar during their stay in Spain and coinciding with the bullfight event (2-4 days before the show). Servitoro, Official Box office of bullfighting tickets sales at Majadahonda bullring. Bulls Tickets to Móstoles for all organized bullfights in the Bullring of Móstoles, Madrid. Festival of Móstoles September 2019. Móstoles is to 21,6 km from Madrid (30 minutes' drive from Madrid). How to get here | Driving Direction. Request information and advance tickets booking for all bullfighting events : You may book in advance and be the first to purchase tickets to any event at the Móstoles Bullring. Servitoro delivery service offers the User the opportunity to acquire the tickets in a safe and easy manner from his/her home address, avoiding long queues before ticket offices. Complete the request information about Móstoles. Once we have the tickets On sale, we send you a booking confirmation e-mail for make your definitive order. Servitoro offers to non-residents the opportunity to deliver the tickets to hotels, hostels and similar during their stay in Spain and coinciding with the bullfight event (2-4 days before the show). Servitoro, Official Box office of bullfighting tickets sales at Móstoles, Madrid bullring. Bullfight tickets to San Sebastián de los Reyes, Madrid, all bullfights organized in the Bullring of San Sebastián de los Reyes, Madrid. Fiestas en honor al Cristo de los Remedios en Agosto 2019. Fast and secure online ordering. Immediate information of all the Bullfighting Festivals. A virtual store with the most powerful technology and design of the sector. Easy navigation, transactions with high security and confidentiality of data. San Sebastián de los Reyes is to 25,6 km from Madrid (36 minutes' drive from Madrid). How to get here | Driving Direction. Cristo de los Remedios festivities: date to be confirmed. Servitoro, Official Box office of bullfighting tickets sales at San Sebastián de los Reyes, Madrid bullring. Bullring of San Martín de Valdeiglesias. Festivities of San Martín de Valdeiglesias in September 2019. Fast and secure online ordering. Immediate information of all the Bullfighting Festivities. A virtual store with the most powerful technology and design of the sector. Easy navigation, transactions with high security and confidentiality of data. San Martín de Valdeiglesias is to 79,9 km from Madrid (1 hour drive from Madrid). How to get here | Driving Direction. Bullfighting Fair Virgen de la Nueva: date to be confirmed. Request information and advance tickets booking for all bullfighting event: You may book in advance and be the first to purchase tickets to any event at the Valdeiglesias bullring. Servitoro delivery service offers the User the opportunity to acquire the tickets in a safe and easy manner from his/her home address, avoiding long queues before ticket offices. Servitoro offers to non-residents the opportunity to deliver the tickets to hotels, hostels and similar during their stay in Spain and coinciding with the bullfight event (2-4 days before the show). Servitoro, Official Box office of bullfighting tickets sales at San Martín de Valdeiglesias bullring. Fiestas Populares: date to be confirmed. Servitoro, Official Box office of bullfighting tickets sales at Torrejón de Ardoz, Madrid bullring. Bullfight tickets to Valdemorillo, Madrid, all bullfights organized in the Bullring of Valdemorillo, Madrid. Fiestas San Blas 2019. Fast and secure online ordering. Immediate information of all the Bullfighting Festivals. A virtual store with the most powerful technology and design of the sector. Easy navigation, transactions with high security and confidentiality of data. Valdemorillo is to 39,6 km from Madrid (40 minutes' drive from Madrid). How to get here | Driving Direction. Fiestas San Blas: February 9th and 10th. Request information and advance tickets booking for all bullfighting event : You may book in advance and be the first to purchase tickets to any event at the Valdemorillo bullring. Servitoro delivery service offers the User the opportunity to acquire the tickets in a safe and easy manner from his/her home address, avoiding long queues before ticket offices. Complete the request information about Valdemorillo. Servitoro offers to non-residents the opportunity to deliver the tickets to hotels, hostels and similar during their stay in Spain and coinciding with the bullfight event (2-4 days before the show). Servitoro, Official Box office of bullfighting tickets sales at Valdemorillo, Madrid bullring. Bullring of Vistalegre. Madrid. Madrid's Feria de Invierno 2019. Two bullfighting shows. Vistalegre is to 6,1 km from Madrid (24 minutes' drive from Madrid). How to get here | Driving Direction. * Free for children under 5 years accompanied by an adult. * Children under 14 years old have prices reduced in bullring's box office. Feria de Invierno: February 23rd and 24th. Servitoro delivery service offers the User the opportunity to acquire the tickets in a safe and easy manner from his/her home address, avoiding long queues before ticket offices. Complete the request information about Vistalegre. Servitoro offers to non-residents the opportunity to deliver the tickets to hotels, hostels and similar during their stay in Spain and coinciding with the bullfight event (2-4 days before the show). Servitoro, Official Box office of bullfighting tickets sales at Vistalegre, Madrid bullring.